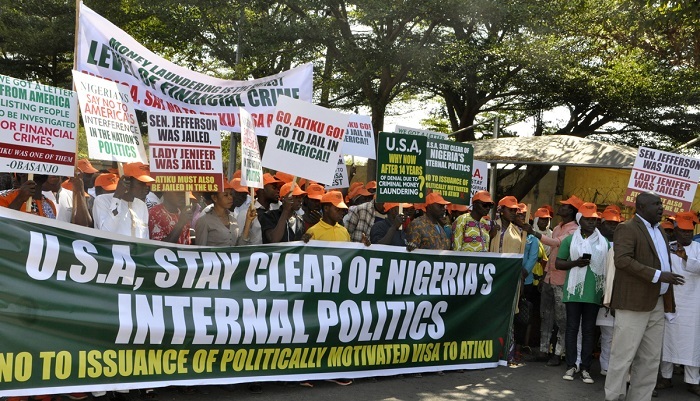 A group of civil society organisations under the aegis of Forum of Non-Governmental Organisations In Nigeria have besieged the US Embassy in Abuja to advise against granting American Visa to Atiku Abubakar, presidential candidate of the Peoples Democratic Party (PDP). Bearing placards as they marched to the embassy on Wednesday, the protesters urged the officials at the Embassy to tread with caution on the matter. 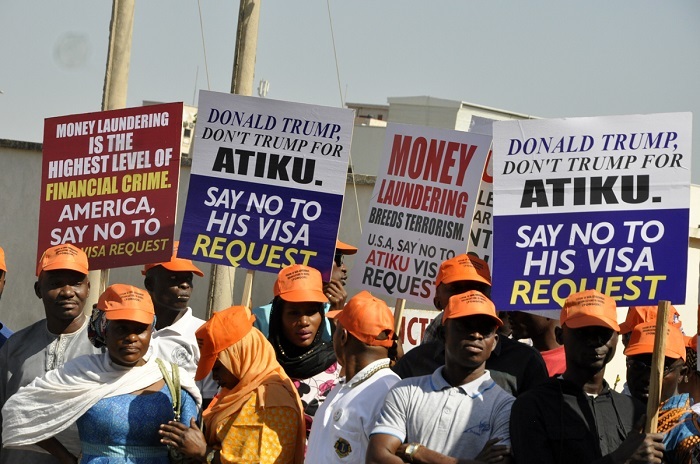 Addressing the protesters, Comrade Wole Badmus, Convener and National Chairman of the group, said they had formally written to the United States Embassy against granting the visa request by the former Vice-President Atiku Abubakar. Noting that issuing the visa would portray the US as endorsing his candidature, he said: “This is apart from the tacit and covert electoral gain such can confer him as the general correct perception in our country now is that Atiku is being denied American visa because of proven cases of money laundering and financial crimes against him. Badmus explained that there is a nexus between corruption and failed state, stating that the World Bank estimated that $1trillion in bribes alone exchange hands worldwide each year. He continued: “A summary of the report indicates that between 2000 and 2008, Jennifer Douglas a US citizen and the fourth wife of Atiku Abubakar, helped her husband bring over $40million in suspect funds into the United States through wire transfers sent by offshore corporation to US bank account. He added that Ms. Douglas owned up when the banks began to question the offshore wire transfers that all the funds came from, stating that “granting American Visa to Atiku would amount to negation of the Patriot Act which makes the acceptance of foreign corruption proceeds a US money laundering offence”. He added that it would make a mockery of the United Nations Convention against Corruption enacted in 2003, in which USA played an active role in its enactment and presently ratified by more than 140 countries.